The title is actually the "name" of the clock, from right above the hands. I made this piece around the same time as I was working on the Desiredata piece for Digital eARTh in Vancouver. (which has a great picture of the first watch I ever owned -- a Timex classic-- spun on a flatbed scanner) My fascination with ideas of time has been with me as long as I can remember. I see time as mutable and not as the fixed increments we all understand it to be. It should be noted that I have (as I was once told) an all-time record for tardiness at my junior high school, even though I lived only a short distance away. 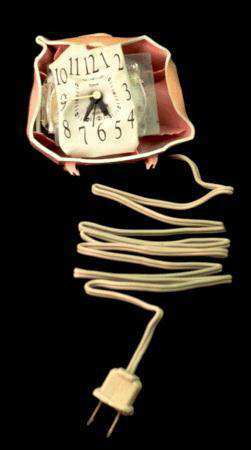 In a way, this piece is a 3D form of what Dali was getting at with the melting clocks in the "persistence of memory." There were other clocks I melted, and a few other objects too, but this is the only one I documented. If I had it here, where I am now, I would change it so it had a curly, spiralled cord. Dimensions: 3" x 4"x 2.5"